In this episode, we’re down our 4th Musketeer due to illness (no, really … he wasn’t kicked off the show for becoming a traitor … REALLY) and the remainder of the crew is recovering from the zombie turkocalypse. In game, Breja spent some time smashing all the things, Jen played around with monster power, and Nevik is ONE KEY away from having 3 Infernal Machines. * We read, and respond to, another mountain of email we received from our wonderful listeners. This batch comes to us from Smokimus, Commander Bird, Chad and LunarFisher. Thank you for the many emails! Keep them coming! * We received tweets from @tigjamie, @Rilandune, @wayngotango and @zesty1986! Thank you for your tweets. Don’t forget that you, too, can send in your thoughts via social media outlets such as Facebook, Google+, and Twitter. * We finally got down and dirty with Monster Power. What is monster power? How do you enable it? How does it affects your gameplay? Is it required or is it truly optional? Are there instances where it is “required”? Are there any improvements that can be made? All these questions are discussed and answered to the best of our abilities. For more detailed information (namely all the specific numbers) visit Blizzard’s Monster Power blog. * Our next Diablo 3 gaming night is coming up (spurred on by @Wayngotango) and will either be held on December 7th or 14th. 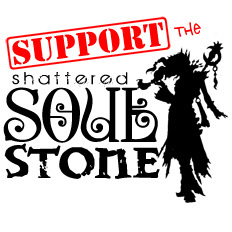 Stay tuned to our @ShatteredStone twitter feed to get the final details. * Our in-depth discussion of Monster Power was inspired by a debate brewing on the DiabloFans forums about whether or not the XP bonus for monster power was adequate in Inferno or not. There were some fantastic points made in the thread: “MP xp scaling broken” so check it out. * Patch 1.0.6 dropped on November 27th. Check out the patch notes (or lack thereof) to see what changed! * A few episodes back we mentioned that the short story collection — Heroes Rise, Darkness Falls –would be receiving the digital eBook treatment. Well, now it’s available! Check out the blog post announcing the release of the collection and where to find it! Included are excerpts from two previously unpublished short stories. * Nevik mentioned the Alkaizer XP Grind Route. For a detailed list of what route Alkaizer took on his gloried path to world-first Paragon Level 100, visit this post on the Diablo III (Unofficial Fan) Blog. * Blizzard recently registered the domain ProjectBlackstone.com (there’s nothing there yet), could it be related to the forth-coming expansion that we have no details about? Only time will tell, but for now you can head on over to Diablo IncGamers and partake in the speculation for yourself. * Nevik recently got around to updating his oft-neglected blog with a post about “Where’s the PVP?” In said post Nevik thought that we would see PVP specific gear introduced only to be debunked hours later by Jay Wilson on twitter. * Finally if you have a fellow loot-deviant that you need to shop for during the holidays Jen compiled a few links of places to look for Diablo-sch’wag. Check out: Blizzard’s Store, Jinx’s Diablo Collection, or Amazon!